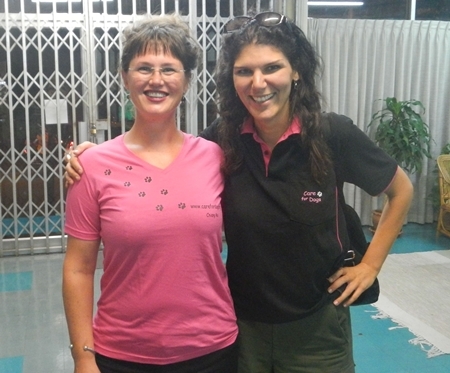 Care for Dogs Co-Founder Amandine Lecesne (right) is joined by volunteer and donor Katie who, after helping out around Care for Dogs for a few days, donated $3,000 to Care for Dogs to cover an upcoming sterilization program. Care For Dogs is working to treat and sterilize as many stray, street and temple dogs as possible. For more information please see www.carefordogs.org. Khun Ruchuchai Potha, head of the Work Permit Office in the Labor Department presents incoming Governor Tanin Subhasaen with a bouquet of flowers in greeting from himself and the entire staff of the Work Permit Office at City Hall on Tuesday, October 9, 2012. The ladies of the Chiang Mai Expats Club held their monthly formal ladies lunch at the Empress Hotel on Chang Klan Road on Thursday, October 4, 2012. The Expat Ladies meet twice a month, the formal luncheon held at a venue to be announced on the first Thursday of every month and the informal lunch held at the Grandview Hotel on the third Thursday of every month. For more information be sure and check the community happenings calendar. The newest vegetarian restaurant to grace Chiang Mai held a small pre-opening for friends on Friday, October 12, 2012, the owner, Naphat Na Talang is 3rd left. Anchan Vegetarian Restaurant, featuring organic and chemical free food as well as products for sale, held its grand opening on Friday, October 19, 2012 and is located on the small soi off Nimmanhaemin next to Hillside 2. Chiang Mai Chamber of Commerce and Finnish Honorary Consul Narong Kongprasert (2nd left) joins Martin Venzky-Stalling of the Chiang Mai Creative City Committee and TDCI and Chamber members Sorapob Chuadamrong (far right) and Wiwat Pongruengkiat (far left) at the Imperial Mae Ping on Wednesday, October 10, 2012. Dr. Surin Pitsuwan, Secretary General of ASEAN was on hand to speak on ASEAN and the upcoming AEC as well as Creative Chiang Mai. Soho Bar and Guesthouse on Huay Kaew Road held a Disco Night party on Friday, October 6, 2012 where owners Krathai and Shauna (middle and far right) are joined by “Sir Gaga”.